Protect your herd. Protect your business. Rush-Co has brought its Fabric Tension Building expertise to the world of livestock shade! 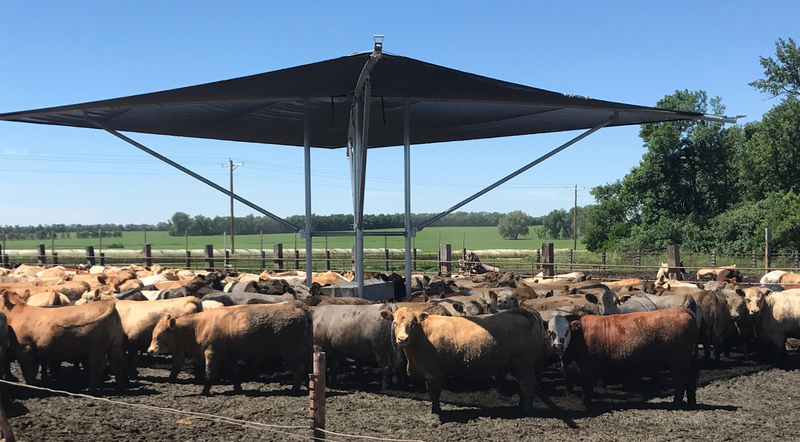 Developed in cooperation with local ranchers, Rush-Co’s portable livestock shade systems are the low cost, durable solution that will protect your livestock from the elements for years to come. Our portable shade systems are easy to install and easy to move on your ranch from location to location. Made from galvanized steel, and a durable vinyl and mesh cover system, you will enjoy a trouble free, long-life, shade system. 31’ by 31’ (961 sq ft) shade area (approximately 65 head of cattle assuming 15 sq ft of shade required per head). 41′ x 41′ (1,681 sq ft) shade area (approximately 100 head of cattle assuming 15 sq ft of shade required per head). Two piece kedered cover system – eliminates wind whip and improves on ease of install (patent pending). Easy one-time installation (with 2 people and common equipment expect only a 2 – 4 hour installation time). Two base weight options (water tank can be included or omitted – if omitted, user weight must meet weight and height requirements). Cover is made of a durable vinyl and 80% mesh combination and reinforced with webbing throughout. Duel cover tension system – cover is tensioned using both coated cable and webbing with 2” ratchets at each corner for superior tensile strength. With the water tank as the system base weight, the water can easily be drained to make the entire system light-weight and easily moveable as a single piece. Built-in fork-lift sockets for easy transportation on your ranch from location to location. Tall 14’ work height allows for your machinery to work below the system without interference. Best Value – Compare pricing and features, and you will see that the Rush-Co portable livestock shade system is the superior choice. For more information about Rush-Co Livestock Shade systems or a free estimate call 1-866-776-5617 or email us. Rush-Co shade systems are the affordable, long lasting way to protect your herd health. A University of Arkansas found that providing artificial shade resulted in an additional daily gain of more than 20% compared to cattle with no shade. A University of Florida’s study determined that dairy cows provided with shade produced 10-19% more milk than dairy cows without shade. Whether you choose a Rush-Co Permanent Shade System or the portable systems, protecting your livestock investment from the elements is just good business. Easy to install in as little as 4-hours for the permanent system. Bolt together components which eliminates the need for welding. Simple to open or close with hand crank mechanism. Built of high-quality material to last for years.